Saint Ambrose Catholic School, a hidden gem within the Archdiocese of Miami, has been educating students for over 50 years. Our mission at St. Ambrose Catholic School is to promote excellence through spiritual, academic, and social growth of our students in a Christ centered environment. At St. Ambrose Catholic School, we strive to develop students through a rigorous and ever-changing curriculum while assisting in their development as leaders and active contributors to the world. Our middle school is 1:1 Chromebooks and powered by Google Classroom. Enhancements have been made to the curriculum that includes a robotics class for middle school and coding in the elementary grades. As a school we offer programs that develop the whole individual such as Band, Drama, Yoga, Student Council, and National Junior Honor Society. Our sports include flag football, basketball, soccer, and volleyball. We strive to ensure that students are challenged, and differences are valued. St. Ambrose Catholic School welcome students of all denominations to learn our Catholic faith and attend weekly masses, in addition to our daily religion classes. We offer open enrollment for students in grades PK3-8, proudly host Sunshine Child Program for After School Care, and offer a Free Voluntary Pre-K program (VPK)! St. Ambrose Catholic School offices are open from 7:30 am to 4 pm, Monday through Friday. Contact us at info.stambrose@gmail.com to schedule a tour, or drop on by during normal business hours. We cannot wait to meet you! 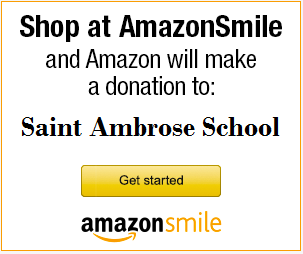 St. Ambrose Catholic School promotes excellence through spiritual, academic, and social growth of our students in a Christ centered environment. I am using this to make some space.